HERNDON, Va., June 7, 2018 — Learning Tree International (OTCQX: LTRE) announced today its expansion of blended solutions to address two key learning challenges in IT training: notoriously low completion rates of self-paced learning, as well as the need for flexibility beyond a classroom event that includes anytime access to relevant content and other engaging learning tools. Learning Tree sees the benefits of blended learning in the workplace as a natural next step in training. 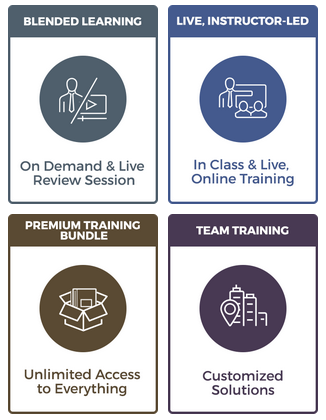 An example of adopting more than just e-learning or stand-alone classroom events, Learning Tree offers the popular ITIL Foundation Certification Training course with all four learning options shown, including bringing training to a client’s facility and the option of customizing content for specific case study use. New blended learning options are also available for CompTIA Security+, Emotional Intelligence, Project Management, SQL Server, Microsoft Excel, and more. As learning needs change over time, and with job roles and project teams shifting, those leading learning and development for organizations must be flexible in their approach to supporting employees, yet also focus on optimizing spend, along with tracking and reporting of results. Learning Tree’s new blended learning approach can support organizations in rapidly providing increased learning flexibility and options for their employees.